His cricketing sledges encompassed everything from dry wit to mental disintegration to good old-fashioned abuse. Ian Healy’s partisan commentary on Channel Nine is not to all tastes. But in his playing days, his pro-Australia commentary from behind the stumps was one of the many reasons to love him – even if you were a Pom. While many players have one smash hit in the world of sledging, like Jimmy Ormond or David Hookes, Healy could release an album that would not have a single bit of filler. His sledges encompassed everything from dry wit to mental disintegration to good old-fashioned abuse. If we listed a full album this page would go on forever, so instead here’s a Healy EP: four of his best sledges – and one directed at him. Nasser Hussain happily jokes about the size of his “beak”, which makes him a walking tribute to The Simpsons’ Mr Burns. It was an easy target for opponents back in the 1990s and 2000s, though nobody highlighted it with quite the same panache as Healy. No batsman likes being surrounded by close fielders; during a tour match against England, while he was Queensland captain, Healy signalled his intentions by ordering a fielder to go right under Nasser’s nose – only to then demonstratively place him yards away at short extra cover. The old favourite, drawled to umpteen batsmen just after they had been dismissed. Sometimes ‘idiot’ would be substituted with ‘dickhead’; but the triumphant, contemptuous tone never changed. This was not just idle abuse, however: Healy knew that saying farewell to opponents in such a disdainful way would help undermine their confidence further. With that great Aussie team, mental disintegration was an ongoing process, not just for one day or one innings. As their confidence got lower and lower, opposing batsmen had to deal with the voices in their head – and the one behind the stumps. In a one-day final at Sydney, shortly before the 1996 World Cup, Sri Lanka’s cuddly captain Arjuna Ranatunga asked for a runner because of cramp. The fact he had only been at the crease for a few minutes – and that the quicksilver Sanath Jayasuriya was lined up to run for him – did not impress Healy, who politely observed that, as far as his aware, Wisden did not include Law 2 (I) (a) (i) A player shall be allowed a runner if he finds himself short of breath due to a combination of sultry Sydney weather and excess consumption of saturated fats for the majority of his adult life. The use of overweight, unfit and fat may have hinted at tautology, but it helped Healy make his point pretty emphatically. There’s nothing in cricket quite like batting No3. You aren’t quite waiting for Godot, but you do exist in a strange limbo – you could be walking to the middle after one ball, or waiting with your pads on after six hours having read the daily paper 472 times. Mark Butcher was reminded of that during the Melbourne Test of 1998-99. He had dropped down from No3, to allow the captain Alec Stewart to open alongside Mike Atherton. In a surprising development, Atherton was dismissed by Glenn McGrath in the first over of the day. Out walked Butcher with the score on nought, just as he had in the first three Tests, when Healy pointed out that batting at No1 and No3 didn’t really make much difference. Even Butcher chuckled at that, though he wasn’t laughing when he was out for a duck in McGrath’s next over. England were battling to save the Sydney Test of 1990-91 when Mike Atherton, on his first Ashes tour, appeared to get away with an edge to Healy. At the end of the over, Healy called Atherton a cheat for not walking. Atherton’s response, calling upon decades of Australians not walking, was a comic gem: a haughty landgrab atop the moral high ground. For once, even Healy had no reply. 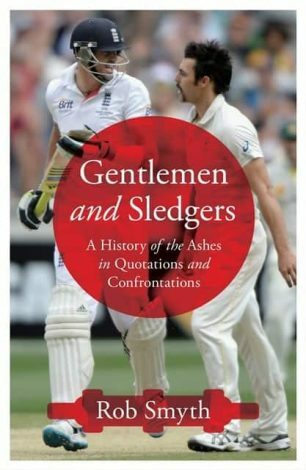 Rob is a Guardian and Telegraph sports journalist and the author of ‘The Spirit of Cricket: What Makes Cricket the Greatest Game on Earth’, and the co-author of ‘Danish Dynamite: The Story of Football’s Greatest Cult Team’.